You Could Just Set It and Forget It with Marketing Automation…But Don’t! If you are under the impression that “set it and forget it” is a successful strategy for using marketing automation software, I release you from this spell. People will say one of the benefits of marketing automation software is that you can simply put the software in action and then let your automated campaigns go their merry way. But just because you have the ability to set your automation rules and then forget about them doesn’t mean this type of strategy will be the most effective. 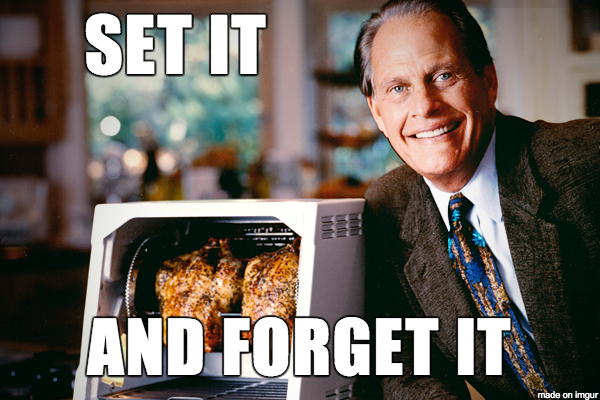 "Set it and forget it" can work for rotisserie chickens, but it won't work for your marketing automation strategy. What actually makes marketing automation useful? The real reason marketing automation software makes the marketer’s day-to-day more efficient is because it exponentially increases productivity and the level of insight you have about your marketing efforts, while decreasing the amount of time you have to spend on manual tasks. It can do more for you than you can do on your own, giving you a heightened ability to run targeted marketing campaigns. You can automate repetitive tasks and manual processes. You can analyze campaign performance. You’re informed about members’ digital activities. You can create targeted marketing campaigns. If you’re a marketer on a small team, marketing automation is how you make all your “what if” dreams come true. It’s like having a hive full of worker bees at your service, while you manage it all from your throne. You can take the data from your email marketing metrics, social media interactions, website activity and more, and use marketing automation to have them work as a hive mind. Each aspect can be connected to dictate the pathways and actions triggered during a unique subscriber’s experience. The key to it all? If you’re not taking advantage of the insights or managing the worker bees, you won’t realize the full potential of your marketing automation software. Once the logic is in place, don’t be an absentee ruler. Any good Queen Bee should be very aware of what is going on with her drones. In other words, the “set it and forget it” strategy isn’t a growth-focused approach. A successful marketing automation strategy involves monitoring and evolution. You, as the marketer, need to take the reins by watching your reporting dashboards, observing what is and isn’t working, and adjusting accordingly. Look at marketing automation as a new tool for your marketing toolbox, not as your replacement. Establish goals so that you can measure campaign performance. These goals will be your baseline as you monitor your campaign. Track results against your goals. If you start running an automated campaign, you need to keep an eye on the performance. Of course, it’s always a great idea to set yourself up for success by doing rigorous testing and planning ahead of time. You ideally should be testing your content to optimize clicks and opens and making sure the logic rules are triggering the actions you intended. But sometimes you won’t find out that something isn’t working until it’s live with your actual subscribers. Marketing automation allows you to break away from one-size-fits-all marketing. You want your subscribers to feel like their experience has been tailored just for them. But nothing goes against that more than allowing a campaign logic error to send them down the wrong path. Let’s say you set up an automation rule incorrectly, and members are receiving an email that’s not applicable to them, and you don’t realize it for 6 months. They may unsubscribe, or just stop engaging with you all together. You are only human, and your automation is only as perfect as the logic you implement. Mistakes happen, but the key is to check in regularly, so you can catch and correct errors quickly to minimize impact. So how often should you monitor your campaign? That all depends on the actions within a campaign and how often they’re supposed to happen. If there is daily activity, such as triggered mailings or a logic check that will reroute subscribers down a specific path, then take a quick peek every day. You will want to check frequently after your campaign launches. As you see subscribers successfully moving through all the possible pathways of your campaign at least once, you may be able to check a little less frequently. You’ll have seen that everything is running according to plan, even if the campaign is ongoing. For monthly campaigns, there’s not much sense in checking when you know that nothing is happening in the campaign. So, just set a reminder to check in after the main action or actions have happened. Overall, if you’re seeing too many unsubscribes or a total lack of engagement, pause the campaign and make some changes. Don’t let something that isn’t effective continue to run. Marketing automation is all about evolution. Setting up your marketing automation software and then letting it run un-monitored is a waste because you’re not taking advantage of all the insights, fluidity, and opportunities for evolution your software has to offer. Marketing automation can transform a one-person marketing team into a full-service marketing program, but your strategy needs nurturing, just like your members do. Ultimately, the purpose of your marketing automation software strategy should be to provide your members with a tailored and relevant user experience so that they are recruited, engaged, and retained. If you’re establishing goals, tracking results, and modifying your campaigns as needed, you’ll be well on your way to fulfilling this purpose.